Exclaim! cover stars HAIM have had an excellent year, which they topped off with a high-profile appearance on Jimmy Kimmel Live! The sister trio powered through their hits "The Wire" and "Forever" in front of a massive outdoor audience. Those who saw the band on Saturday Night Live will be happy to know that bassist Este Haim's intense bass face is still in full effect. 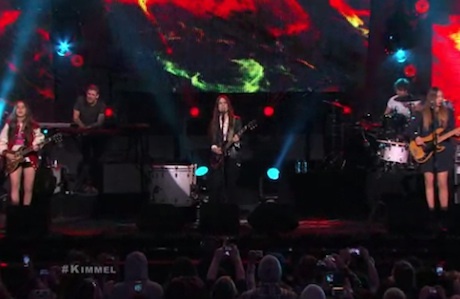 Watch both performances from Kimmel below.